The solution to this problem does not just rest in the hands of law enforcement to find these violators and prosecute them but within each and every person to make the conscious choice not to drink and drive. There is always a better option. Keep the roadways safe along with your loved ones and the loved ones of others by not drinking and driving. 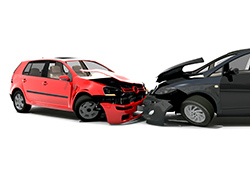 Injured in a car accident caused by a drunk driver? Call our office and consider it done. We will be there every step of the way. We know how to pursue a claim against a drunk driver and we will for you. Is there a low risk of apprehension when driving drunk? Perhaps the single most significant factor in explaining why people drive while impaired is that they believe that there is little risk that they will be caught by police. Sound crazy? Statistically, they are correct. The Associated Press in 2004, citing a study by the Wisconsin Bureau of Transportation Safety Administration, stated that by some estimates, the average drunk driver will drive while impaired between 80 …and 2000 times for every time he is apprehended, depending on the enforcement capacity of the local police. So it begs the question, how many times did this Texas driver “get away” with drunk driving? Education and Enforcement. That’s we support MADD and will continue supporting them and suing drunk drivers. While other Tampa lawyers claim to sue drunk drivers for causing injuries to others, our firm really does sue them even when they do not have insurance. Not many law firms can say that. For us, it is a matter of principle. What happens when we do sue them and they do not have insurance? If we obtain a judgment against the drunk driver, we send the judgment to Tallahassee DMV and request DMV to suspend the drunk driver’s license. DMV will then suspend the driver’s license for up to 20 years or until they pay the victim. While the State of Florida in the criminal proceeding only suspends their driver’s license for 6 months, the victim suspended the license for 20 years. A small victory for the victim. Click on the link below for details. In 2015 alone, we have done this 4 times and twice the drunk paid the claim personally. 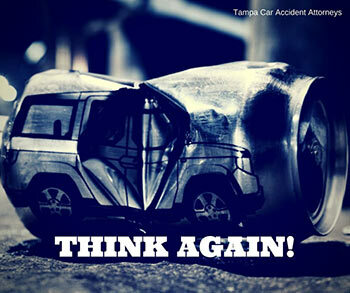 If you have been injured in a car accident call a Tampa Attorney who can help you in your time of need. Are you the designated driver or the least drunk driver? Abstain from drinking alcoholic beverages, so you can drive your drunk friends home. However, a recent University of Florida study shows the message is not getting through. Their results show that 65% of designated drivers had a breath alcohol concentration (BrAC) of less than .02% (they “abstained” from drinking); 17% had a BrAC of .02-.049% (these are drivers that are considered to have been “drinking”); 18% had a BrAC greater than .05% (these were considered “impaired”). Basically, one-third had been drinking alcohol before driving. That’s not how it works! If you’ve agreed to be the designated driver, don’t drink. If you’ve been drinking, don’t drive. Factoid: if you’re BrAC is greater than .05%, you’re not in the clear. A jury can convict you at a .05 BrAC. (See Fla Stat. 316.193). If you’ve been injured by a drunk driver, call an attorney who can help. than .05% (these were considered “impaired”). Basically, one-third had been drinking alcohol before driving. That’s not how it works! If you’ve agreed to be the designated driver, don’t drink. If you’ve been drinking, don’t drive. Factoid: if you’re BrAC is greater than .05%, you’re not in the clear. A jury can convict you at a .05 BrAC. (See Fla Stat. 316.193). If you’ve been injured by a drunk driver, call an attorney who can help. 813-229-5353.